SeedMadness ships worldwide but we strongly advise you to check your country and state laws to check that you can legally purchase the products we sell. All of our packages are shipped "ultra securely" in different forms of packaging to ensure they arrive in good condition. The customer name and address is the only information shown on the package. 1.1.1. You may cancel your order for the Goods at any time prior to receiving a Confirmation Notice from us so long as you contact us in writing. You can send us a cancellation notice by sending an e-mail to info@seedmadness.com or a letter to Unit 1, Dolly Lane Business Centre, Dolly Lane, Leeds, LS9 7AS. Your cancellation notice must quote your name, address, the name or a description of the Goods and your order reference number. 1.2.1. You are entitled to cancel your Contract at any time prior to receiving the Goods so long as you provide us with written notice or, if you have received the Goods, so long as you provide us with written notice at anytime within 7 working days starting from the day after you received the Goods. You can send your cancellation notice by email to info@seedmadness.com or a letter to Unit 1, Dolly Lane Business Centre, Dolly Lane, Leeds, LS9 7AS. Your cancellation notice must quote your name, address, the name or a description of the Goods and your order reference number. 1.2.3. The Goods must be returned to us in the same condition in which you received them until such time as the Goods are either collected by us or delivered back to us by you. You must return the Goods with its original packaging, unopened and with the original invoice. 1.3.1.3. provided that you return the Goods to us and we are reasonably satisfied that the Goods have not suffered damage after delivery. 1.4.1. Alternatively, at your option, instead of a refund (and subject to returning the Goods as required under this clause) we will replace the Goods with the same or a similar product (subject to stock availability). 1.4.2. In order to claim a refund or replacement item please send us a cancellation notice as soon as you become aware of a problem and no later than 5 working days after receipt, by email to info@seedmadness.com or a letter to Unit 1 Dolly Lane Business Centre, Dolly Lane, Leeds, LS9 7AS. Your cancellation notice must quote your name, address, the name or a description of the Goods, a brief description of the problem, fault or damage and your order reference number. 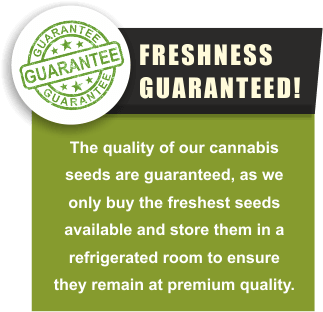 1.6.2 We will ship the correct quantity of seeds ordered but reserve the right to send different pack sizes to enable a faster delivery. 1.7.1. We will examine any returned Goods and will notify you about your refund or replacement item via email within a reasonable period of time. We will usually process a refund or delivery of a replacement item as soon as possible and, in any case, within 5 days of the day we confirmed to you via email that you are entitled to it. Refunds will be made by crediting the payment card or electronic payment account you used to purchase the Goods. 1.8.1. Orders will be dispatched within two working days of the order. Please allow up to 3 working days for the delivery of your order in the U.K. and up to 25 days for Rest Of The World orders. 1.8.1. Your order will be dispatched on a Royal Mail First Class Signed For service unless explicitly requested otherwise. 1.8.1 If a non-signature service is explicitly requested, then the Money Back Guarantee is no longer valid. 1.8.1. Depending on the value of the order or destination, we may choose to send your order Special Delivery.